Mario; very nice ! something you don't see every day. French use also. Outstanding find ! Really dig the old Diggers! Did you have to do any restoration to the machine ? Nice find the Frans digger Bonzini Bridge Transporter, I now it for 30 years white my friend,said his had cancer and passed away ,but wanted the digger go to my. The Buckley find original like on the pictures ,that the best find off my life,most Buckley the find are painted black ,this one the owner have it almost 30 years ,and the bought it from the first owner from the hotel. Locks for the Buckley digger are made by Dudley lock company . Supposedly the Dudley lock is identical to a Mills lock . I had thought all Buckley Deluxe were painted black . Nice to see the variation in natural wood ! Your Buckley really looks nice . 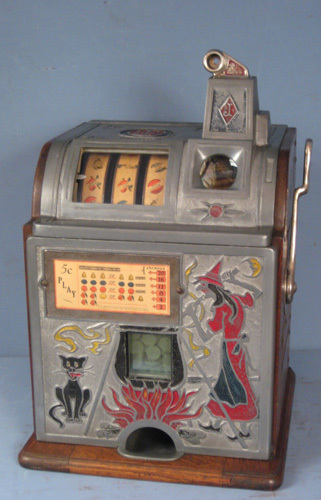 Do you have a picture of an original cash box ? I have to cash boxes , both are different size . I don't think either one is an original . Nice diggers you have ! You could have it black lacquer or Mahogany finish! See letter I resive from the best I now on diggers! Yes. Yes. You have made the best buy of your life! That is an excellent machine. Quite beautiful. Remarkable that you got it Again: CONGRATULATIONS! To answer your question: That model Buckley was known as the "Deluxe", it was also sometimes called the "Chicago Deluxe" because a previous model was called the "Chicago". It was offered from the factory in black lacquer or mahogany finish. I have found that they were both made of birch wood and then either stained "mahogany" or painted black. There is an old booklet about this model with many interesting details and facts, including parts blueprints. It is called "The Coin Slot Guide to the Buckley Digger" . I think it is available at the Crow River Trading Co. web site. Try: www.crowriver.com in the books category. If you can get one you will enjoy having it to go with your machine. I am very happy for you to make this purchase. I know you love these things.